Carefully expressed, in the legion,the ride-horse was as valuable as an armed soldier. Therefore it is a matter of course that there was also a VETERINARIUM in addition to the VALETUDINARIUM - a hospital to attend ride- and trailing horses- in the legionary camp. *19) We do not know exactly where the VETERINARIUM was located within the area. The Roman historian HYGIN describes a VETERINARIUM in his description of route-camps, but nothing was said about the function of this strange facilities. It was mentioned only that this VETERINARIUM was located next to the FABRICA, the movable black smith facilities *20). A similar grouping can be found in the Novaesium legionary fortress. The buildings mentioned, nr. 125 and 126, are located next to a extended factory building in the RETENTURA. If all ground plans were compared, the two buildings could be the VETERINARIUM. 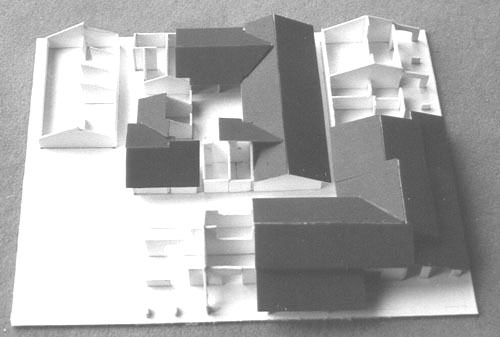 The smaller building nr.126 provides the possibilities for a large-scale surgery with adjacent folds for waiting. 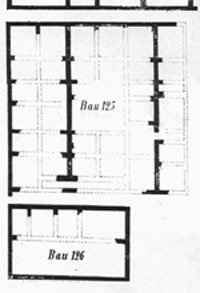 The building next to it, nr.125 is an ideal completion to the closed complex with folds for short-and after surgery of horses. Block 125 had a size of 625 m2 and contained 30 folds. With the approx. lengths of 3,7 m and width of 3,2 m of each fold, 60 to 80 horses could be sheltered and attended. In addition to this more ride,-trail,- and pack-horses could be treated in the large rooms of the adjacent taverns located at the VIA DECUMANA. Horses with infections and packhorses were kept separately outside the fortress. Building nr. 126 had a size of 160 m2, half of this space could be used as surgery. There are many reasons to consider that these buildings were used as VERTERINARIUM.